Authorities reached out to the public Tuesday for help in identifying and locating a woman and two men who burglarized three San Diego-area homes over the summer, making off with thousands of dollars worth of valuables. On the afternoon of Aug. 13, a female thief rang the doorbell of a residence in the 6300 block of Glenmont Street in Del Cerro, according to police. When no one came to the front door, her two accomplices broke a rear sliding glass door, went in and stole several items. About an hour later, the same woman rang the doorbell of a home in the 5700 block of Jackson Drive in La Mesa. When the homeowner appeared, she asked him if “Tony” lived there. The victim said no and went back about his business. The homeowner then went out. Upon returning several hours later, he discovered that his rear sliding glass door had been shattered and three bedrooms ransacked. The intruders stole roughly $7,600 worth of jewelry and other miscellaneous items, police said. Late on the morning of Aug. 29, the same three thieves burglarized a home in the 13000 block of Calderon Road in Rancho Penasquitos, getting inside once again by breaking a rear sliding glass door and stealing numerous high-end purses with a combined value in excess of $10,000. 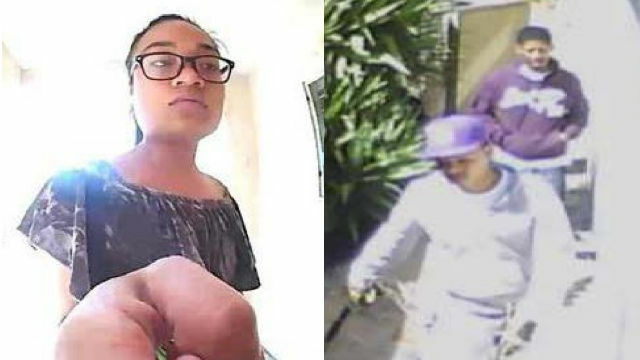 The burglars were described as a slim Asian woman in her 20s with large black-framed glasses, long green-painted fingernails and a tattoo on her left forearm, accompanied by two thin, roughly 5-feet-8-inch black men who appeared to be in their 20s. During the crimes, the thieves were traveling in a black Chrysler 200 with paper license plates and possibly a white four-door Mercedes-Benz. Surveillance cameras captured still and video images of the trio. Anyone with information about the break-ins was asked to call San Diego County Crime Stoppers at (888) 580-8477 or contact the agency online at sdcrimestoppers.org. Tipsters may remain anonymous and could be eligible for a reward of up to $1,000.